Airmen assigned to the 1st Air and Space Communications Operations Squadron perform pushups during a physical training session March 14 on Ramstein. The 1 ACOS has challenged themselves to complete 435,000 pushups by June 2018. They chose 435,000 as a way to pay homage to their wing, the 435th Air Ground Operations Wing. 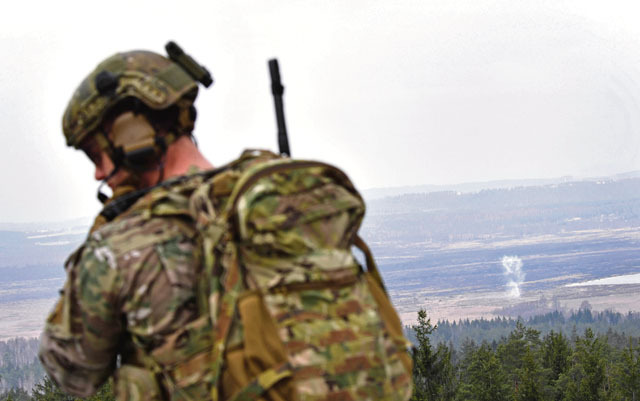 The 1st Air and Space Communications Operations Squadron is known for pushing boundaries, as evidenced by the motto emblazoned over their shield “The Best Done Better,” but the 1 ACOS Airmen have decided to challenge themselves to push in a different way. Beginning October 2016, Airmen assigned to the 1 ACOS have challenged themselves to complete 435,000 pushups by June 2018. “The pushup challenge is something I took away from one of my deployments,” said Maj. Eddie Edwards Jr., 1 ACOS commander. “On my way to Iraq, I passed through Al Udeid Air Base, Qatar, and the 379th Communications Squadron was doing a pushup challenge. They were doing 379,000 pushups. The 379 CS chose their goal because of their unit’s designation, so similarly Edwards thought the 1 ACOS should follow suit and initially suggested they aim for completing 100,000 pushups. “They were also the 379th (Air Expeditionary Wing), so I thought why don’t we do the 435th (Air Ground Operations Wing)?” Edwards recalled. “I also did the math, and it wouldn’t take us too long to do 100,000 pushups. So, 435th (AGOW) is the right way to go. Thus, they added the additional pushups to their goal. With approximately 100 Airmen participating, Edwards and his team estimate that each person would need to do about 600 pushups a month to reach their goal. Every month, a point of contact for each flight reports their monthly total of pushups to Curtis so she can track the squadron’s progress. With approximately 15 months left until they reach their deadline, the 1 ACOS has already achieved 37 percent of their total goal. Though they are working as a team, that doesn’t mean there isn’t some friendly competition between the flights within the 1 ACOS. 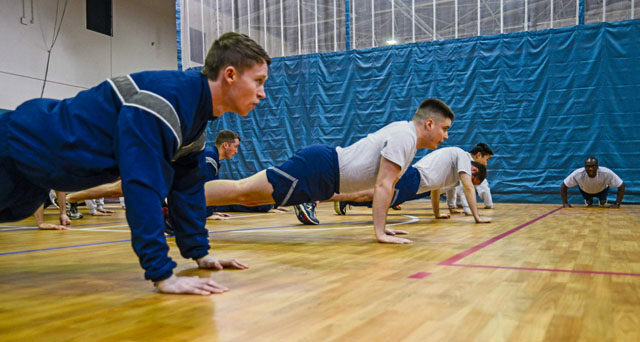 Operating under a two-person integrity system, flights are able to count pushups that are done during the PT sessions, physical fitness assessments, and even random pushups done within their offices. “They’ll only count if another Airman saw you do them,” Curtis said. As of February 2017, the 1 ACOS Storage Virtualization Shop (SCOO) leads the flights in total pushups done. Though there isn’t a reward other than bragging rights set for the flight that contributes the most pushups toward the 435,000 goal, individuals and even flights do still benefit from the competition. As members of a communications squadron, many of the Airmen assigned to the 1 ACOS are often sitting in a windowless building at a computer for much of the day. The challenge was designed to be an internal test for the 1 ACOS, but with them paying homage to the 435 AGOW already, Edwards also welcomes leaders and other units from the wing to join in on the fun. “Hopefully, when we invite wing leadership over or have them out to PT, maybe we can get Col. (Andra) Kniep, (435 AGOW commander), and Chief (Master Sgt. Samuel) Simmons, (435 AGOW command chief), to contribute some pushups,” Edwards said. Though challenging the other units in their wing would be an added benefit, Edwards really wants his team to focus on the real accomplishment.